Yoga Chautara chooses to stand as the chautara in the intervals of the journey, in the life of every traveller, every potential Yogi and Buddha. With the objective of providing practice, experience and teachings, on the knowledge and wisdom of health and spirituality, we offer Yoga, Reiki, Myotherapy and Naturopathy, encouraging all the travellers to experience the harmony of their mind, body and emotions. Like a giant pipal tree on a chautara, shading its travellers, we provide services of natural therapies designed to bring different bodily function into perfect coordination. 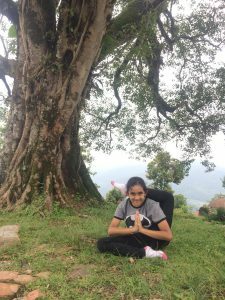 At Yoga Chautara, we care to help students build a healthy eating habit by offering Ayurvedic and medicinal food on the menu. We emphasize on minimising health risk and reduction of any presenting health concerns of our students. The Yogic Kitchen at Yoga Chautara takes in charge of the health food providing opportunities for students to discover Ayurvedic and medicinal food by offering yogic food and cooking classes. We will fulfil our aim by standing as a dedicated and humble platform welcoming everyone to unwind, rejuvenate, awaken, and continue their journey of life to their destination. At Yoga chautara you have many choices. You may do a comprehensive Yoga and/or Reiki courses, choose to drop in for morning or evening yoga classes, revitalize or even more; gratify yourself with the experience of transcendental hands on healing treatments, the Rejuvenation massage (Myotherapy) and Reiki ! Yoga in spiritual term is understood as the union of the individual consciousness with the universal consciousness. In scientific term Yoga aims at bringing different bodily function into perfect coordination for the good of the whole body and harmonise the mind, body and emotions. However for most people it is a practical and familiar starting point to understand yoga as a science that begins to work on the outermost aspect of the personality, the physical body. ‘Chautara’ is a Nepalese word derived from Sanskrit root word “Chau” (four), ‘Ch’ pronounced as in chocolate, “Tarvi” (direction). 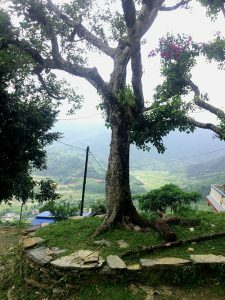 In Nepal chautara means a platform usually a square shape, built of stone and brick for sitting and resting beside the trail often shaded by giant Pipal tree, the Bodhi tree. 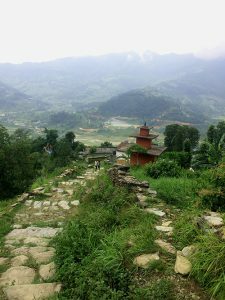 In old days when motorised transportation were not introduced in Nepal, people travelled by foot on the trails, often steep slopes and stone steps, making a large portion of the length of those paths in their journey. At intervals, ‘Chautaras’ were built for the travellers to deposit their carried load, rest and refresh themselves to continue travelling to their destination. History of Siddhartha Gautama (Buddha) having attained enlightenment under the shade of the Pipal tree is well known. Spiritual teachers in old days used such chautaras to gather people and share their teachings. Chautara built near habitation was used as social area for meeting. We still find these chautaras in Nepal and can experience the bliss of resting under the Pipal tree at intervals of our walk.